The humble Fish and Chips has well and truly docked in Paris, as the Royal Baby Effect takes hold across the French capital. George: The Classic Fish and Chips being served with a French touch. It's official. The humble fish and chips are now 'très chic' in the City of Lights. 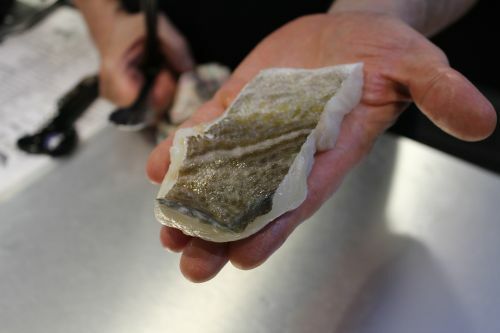 Our favourite battered cod dish is now on the menu across French restaurants, but entire specialty ‘chippies’ now cropping up across Paris, as the popularity of Prince George reaches French shores. Following in the footsteps of the first fish and chip shop to open in Paris, George is the latest in a string of top-quality chippies enjoying a royal welcome to the French capital. 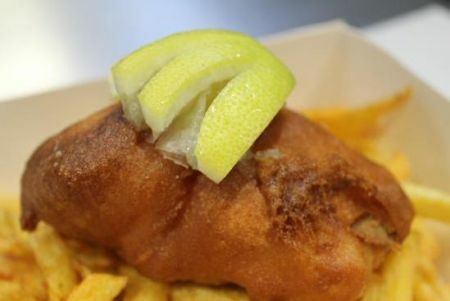 Now the list of fish and chips is growing, with no signs of slowing down. beachy blue-tiled takeaway shop, with an ultra-chic, somewhat posh, touch. 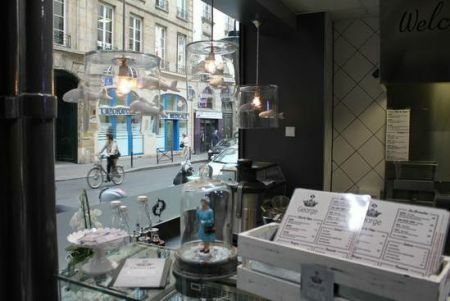 French Fish n' Chips: Located on the trendy Rue de Faubourg Poissonière in the 10th arrondisement of Paris. hang on its’ dark striped walls, including; Mr Clooney, Boy George and our beloved Prince George. The chefs’ own French Bulldog even goes by George. George owners, a former French fashion designer, Gaetan Verplanck and business partner Jean-Marie Garcia - who holds more than 25 years’ experience as a chef - say the French are finally ready to bite into British cuisine. “We (The French) love fish and chips,” Verplanck says. “We go to London about four to five times a year and we wanted to bring the idea to Paris. 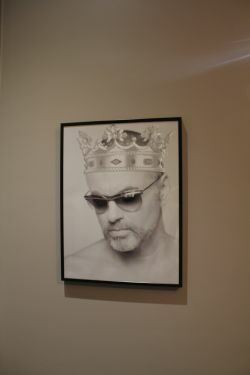 George Micheal: Geogre celebrities hang on the walls. 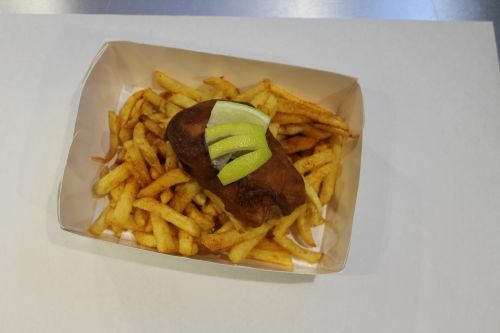 Hot on the heels of the New York burger craze in Paris, waves of French and foreign customers alike, are arriving to taste - Le fish and chips. Classic Fish and Chips: A gourmet, lighter take on a traditional favourite. Aptly located near the metro, Poissonnière (meaning ‘fish monger’), George draws in curious French professionals during their lunch breaks and relived tourists, looking for something familiar for tea. But like a true chippie, about 60 per cent of their business is takeaway. With a menu full of dishes named after British Royals, it has all the classics, but Frenchified in all the right ways. There’s the classic fish and chips, named 'George,' Prince 'Harry' taking the title for fish burgers and the hugely popular veggie burger, 'Pippa'. 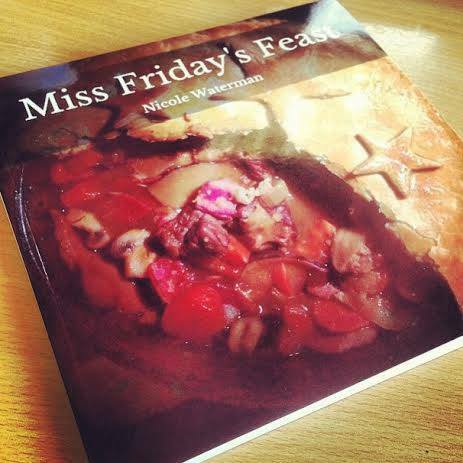 Not to forget the all-important accompaniments, the gourmet-style sides are all homemade and include a velvety tartar sauce, minted mushy peas and a light and a crunchy coleslaw that actually tastes like vegetables. Catering to the delicate market of bio-loving French foodies, Jean-Marie is a chef meticulous about quality. 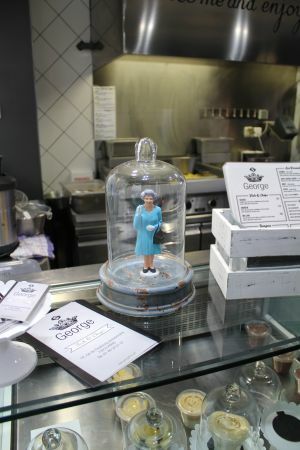 A royal welcome: A mini Queen waves to fish and chip patrons. Sourcing their fish from the Rungis Central Market in Paris, where the catch arrives at 2am, they receive their cod to their door each morning at 8am. Fresh fish: Gourmet Fish and Chips means fresh produce everyday. “We get our fish in fresh every day,” Garcia says, holding up a receipt from the morning’s order. Anastasios Tsiamis, George Marketing Manager, says they are passionate about changing the reputation of British food simply cannot cut it against France’s superior fare. "I think it’s the same reputation where some (French people) still don’t like the American or British cuisine but this fish and chips is something different. “The quality (here) is perfect but the first thing they think is that French cuisine is the best but we will prove it to them". Though The French are now on board with our traditional battered cod favourite, the vinegar bottles at George still sit untouched on the table. One step at a time, England.